Today I am giving you a little tour of my kitchen. I wanted to show you how I store all those beans and grains. 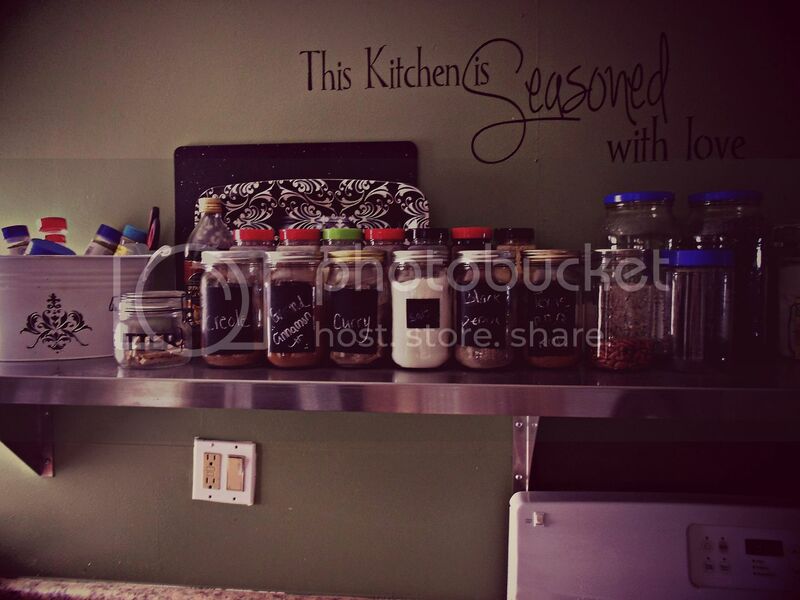 I also wanted to show you how I organize my kitchen, so I am always ready to whip something up for my family. We have a very open kitchen, with a lot of open shelves. Our kitchen didn't come with shelves or cabinets. My hubby had to put all these in himself. HERE is what our kitchen use to look like. Last year we saved up and were able to put metal shelving into the kitchen. We purchased them from Webstaurant.com. 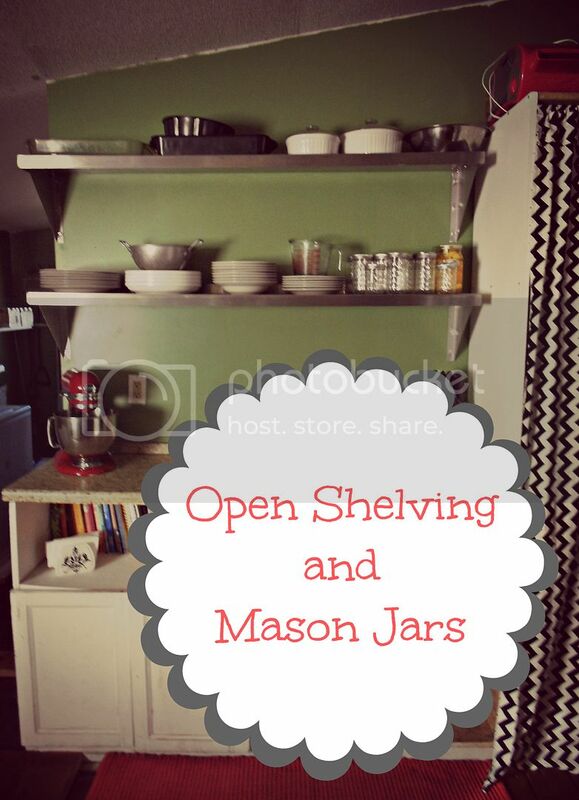 I love open shelving because I can see everything in my kitchen. All my seasonings, pastas, beans, flours, and grains are visible. This means I am not wasting any food, since nothing is getting buried in my cabinets. Making sure no food gets wasted is one of the quickest ways to save money on your groceries. Wasted food means you are literally throwing your money into the trash. Set your kitchen up in a way to prevent this from happening. 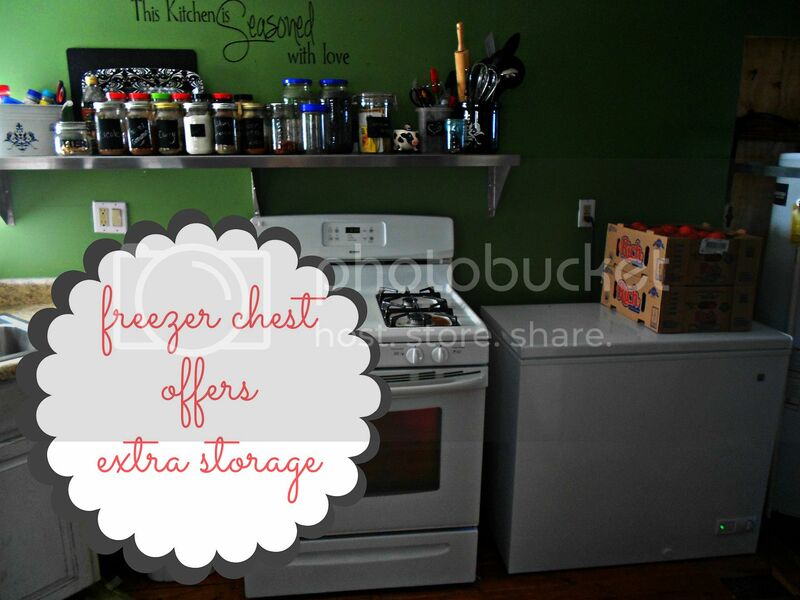 Keeping your kitchen organized is a great way to not only save money, but time as well. Who wants to spend forever in the kitchen when you have a hubby or munchkins to snuggle with? Make sure that everything has a place. Keep spices and pots/pans near the stove, since that is where they will be used the most. Keep things for littles within their reach. This allows them to help out whenever they can (setting the table or putting dishes away). Place things by how frequently you use them. Put items that you use more often in easy to reach places, like on the lower shelves or cabinets. Things that get used only once a month or so, store up on higher shelves. There is nothing worse than when crackers or cereal go stale because they were left in an open box. This is always such a bummer. We prevent this by storing all of our cereals in clear containers. I bought the Tupperware from Wal-Mart. I was able to get them for a great price, they are see through, and BPA free. I also store all of my ready made mixes in these. I also keep a chalkboard on my fridge. This is where I write my weekly menu. I have another chalkboard on my cabinet. This is where my daily to do list goes. I am able to cross stuff off as I do it. It is a great way to keep on track with everything I want to accomplish for the day. I get emailed all the time, asking me how the heck I store 100 lbs of flour. Well, I use food grade 5 gallon tubs from Lowes. They are perfect for storing my beans, flour, sugar, rice, and wheat berries.I try to have at least 100 lbs. of flour, 50 lbs of brown rice, 50+ lbs of various beans, and about 25 lbs or more of wheat berries. These are great basics to have in your food storage. I get my flour and rice from Costco and my wheat berries and beans come from the lds cannery. I know if hard times came we could live off of this stuff and be ok. Being prepared is always key. We never know when those rainy days may come. I also recycle everything. I reuse pickle jars, mayo jars, etc. I use them to store all of our goodies. I love to think of it as "getting more for my money". 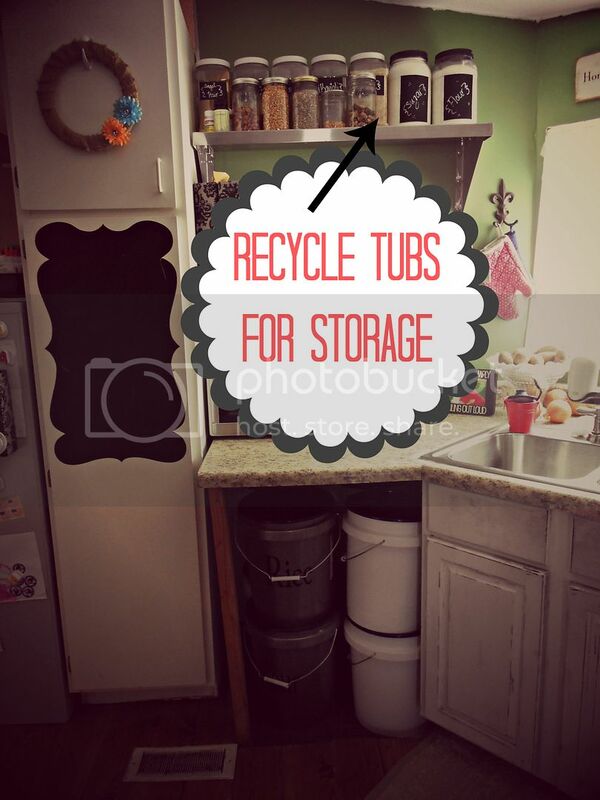 Instead of buying a storage container, I can reuse something others would throw away. It is a great way to recycle. Having clear containers leaves no guessing to whats inside. I love it! A few years ago we were given the freezer chest as a Christmas gift. It has become the best present ever. It saves tons of money, since we are able to stock up on items when they are at rock bottom prices. We then store our goodies in the freezer. We have a few months worth of foods stored in this freezer. Between our dry goods and this freezer, I know we could feed our family for about 6 months....maybe more. We are always trying to increase our food storage. Having an organized kitchen, allows my family to save money and live within our means. My kitchen is like my arsenal for thrifty living. It is how I am able to store all of our food and gadgets to help me make healthy meals for my family each night. Now that you have seen my pantry, I would love to hear about yours! Share your storage tips below. I can't wait to hear how you all stay organized in your kitchens. If you have a kitchen you would like to share on Blissful and Domestic, send me an e-mail at blissful_and_Domestic@yahoo.com Make sure you have great pictures and I would love to have you share with everyone how you stay organized and save money in your kitchen. :) I can't wait! i luv it all - i was wondering where i could buy food grade buckets from. and glad to know that i'm not the only person that reuses every container that i purchase. sometimes i will buy a particular size or style (of things we use) because the reuse purposes are 10x's that of the another style/size. thanks for the heads up on the cereal containers. i was looking for some but didnt want to spend the money from container store and ikea is so far away. i'm going april 19th to our local lds cannery with my aunt and her family. i cant wait! Hi! I have purchased terrific food grade buckets - stackable with secure lids - from my local grocery store for $2 each. They have a bakery/ deli section and so they have a constant supply of big food grade buckets from their suppliers and are happy to sell them cheaply. I have accumulated several! There are four in my kitchen that hold bulk purchase of flours and sugar - one bucket holds around 40 pounds of flour. (I buy my flour by the 50 pound bag at a local Amish grocery store.). I have one right now in my garage full of this summer's fixin' of sauer kraut. So, ask at a locally owned food store that has a deli or bakery section, ours is always drowning in buckets and they are happy to unload them on the cheap. Good luck! You may be able to get food grade 5 gallon buckets at your local grocery. The bakery department get their frosting in them and I bet other departments have theme as well. Great post! I just discovered the food grade buckets at Lowes. I now trying to think of a place to store them filled with flour, sugar and such. I love, love Mason jars really any glass container. I have my pantry full of them. Seeing what you have in your pantry is such a plus! this is neat! nicely done! Thanks for sharing - I love this post! I love all the detailed organization in your kitchen :) I also recognized a lot of favorite kitchen "things" that we have in common - clothespins, mason jars + white dishes! Thank you so much for your sweet comment. That is always what I want to portray and I am happy it is coming through in my posts. I am just a wife, mother, and blogger. We don't do fancy, but we do like clean, pretty, and organized. I always believe there is more beauty in the homemade, than the store bought. Thank you again for your sweet comment. Danielle that is so true and so well spoken.. I have to agree with Laura too.. I love that this is a real at home kitchen made with love.. it is very tidy, organized and I could see myself working just fine in the kitchen and we have a family of 6.. way to go!! Love your ideas.. we just moved to where I have space to do some storage and I have already bought the buckets and started filling them.. Thank you for all you share with us!! I was thinking the same things! Our kitchen is not fancy....but it's pretty and clean. I love seeing pics and info from a 'real' mom, wife, homemaker. When we moved into our home 20 years ago the kitchen was in horrible shape and we remodeled it with cabinets taken from both my parents and bro/sil's homes. (My parents have a home next door to the house my brother now lives in. Before my brother lived there, my uncle and his family did...they remodeled their kitchens at the same time with the exact same cabinets. I got some of each when they both remodeled again years later! Kind of heartwarming!) We repaneled and later painted the paneling. When my husband got a good job about 10 years ago we bought new appliances...I was thrilled! My husband and I installed laminate flooring at one point and we got new (matching, for the first time) counter tops at another point. The finishing touch was an island my husband made from an older hutch my parents have us....pie boards dress the top....I love it. My point is that we did things along as we could and I am proud of our efforts...and the fact that it's paid for!! Matter of fact my dh and I have 6 more house payments and we'll be paid in full! I started a frugal journey 2 years ago when my husband was facing a layoff at his former job. We cut back and I got busy reading all I could to learn how to save every penny possible. We LOVE our new frugal lifestyle. The layoff happened....dh working away for a year happened...then answered prayer happened....he got transferred home to work!! We are real people with real problems and real solutions. It's good to see others like us appearing here and there in bogs and books!! Our kitchen is super small and I am still developing my way to keep things in order and not foget them. I hope to install an extra shelf next month and to have more space. What helps me a lot is IKEA rode with a lot of hooks, because my things do not get messed up easily. Wow, you really did a nice job with your kitchen. I am just blown away by the creativity. Wow, you've really done a nice job with your kitchen. The ideas and creativity just blow me away. You are too sweet. Thanks so much! nice job! were in the process of building our own house and the best part of it is the pantry! it is 6x24! so exciting. this post gave me some good ideas! Oh, I love the way you've organized your kitchen! Organization is a huge issue at our house, especially in the kitchen, and I'm always on the lookout for ideas to use to keep things neat and in designated spots. I was actually working on this today! You've done a great job with what you have. I love that it is actually things I can afford to do, instead of thinking "Wow, that's great...if I had bakoodles of money to blow!". :) Thanks for sharing. I love your ideas! 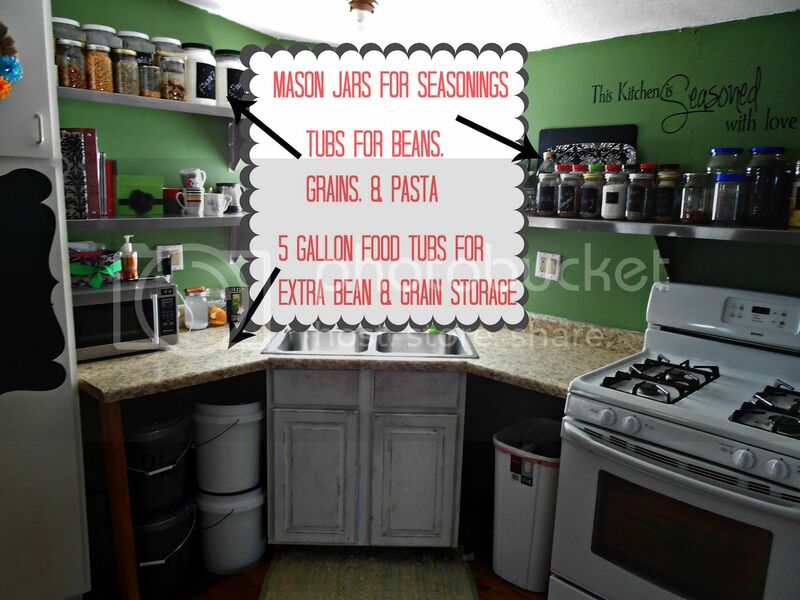 I am thinking that you probably don't have basements in your area (very few basements down here in Phoenix), but I love your ideas for food storage sans basements. We have food storage but are desperately in need of ideas to get it whipped into shape. Now that we only have one kid left at home, I usually buy, and prepare too much food and I need to do better at that too. I love how you have made your basic home lovely, inviting and totally livable for your family! Oh man I wish we did. Only a few older houses do, but we do not. I seriously love houses with basements. So cool! THank YOu, I will try asking my local bakery dept for some. Thanks for sharing all your ideas. I am now baking all of our bread. I scored 2 FREE bread machines just by asking on facebook! The weather is finally getting warmer here in upstate NY and I can't wait for garage sales to start. I'll be looking for mason/canning jars and canning equipment. My question is about wheatberries. Can you share how you prepare them and what are the ways you use them please? We have a great co-op and I've been talking to the manager about doing a special bulk order for me. Starting a list for those items now. At wheat harvest time, (July in our area), one can go to the local farmer's elevator (where farmer's sell their wheat) and purchase a bushel or whatever. Think of the orginia; source of foods. You can get food at cheaper prices. See a lovely large garden, stop and ask if the owners would sell some produce, bypassing the Farmer's Market or grocery store. I feel that kitchen cabinets are a huge waste of money that home improvement and builders have convinced us that we need so that they make money. We will be moving in a couple of years and my next house I will rip out the cabinets and have a huge pantry put in. I also have taken off the cabinet doors and painted inside of the cabinets and have open shelving. I really wanted an island but my kitchen is way too small and so I put a sofa table that has two open shelves and set my pots and pans on those shelves. I put a curtain rod on the back of the sofa table and I can now hang my towels and dish rags. Since sofa tables are long and narrow I have room in my kitchen and it works like a kitchen island. I just thought I would throw this idea out there. I get all of my 5 gallon buckets for free. I just go to Albertsons or any grocery store with a bakery and I ask them for there empty frosting buckets. They have frosting all over them but I just clean them out and I have a free 5 gallon bucket. This is a fantastic way to save money. You are so organized!!! it helps in everyway to see what you have and what you need. I am dying to know what the quote on your wall says! A tip about storing spices: spices are best stored away from heat and in containers that are not see through. This is because heat, air and light cause the oils in spice to evaporate, in turn degrading the potency, freshness and flavor of spices. 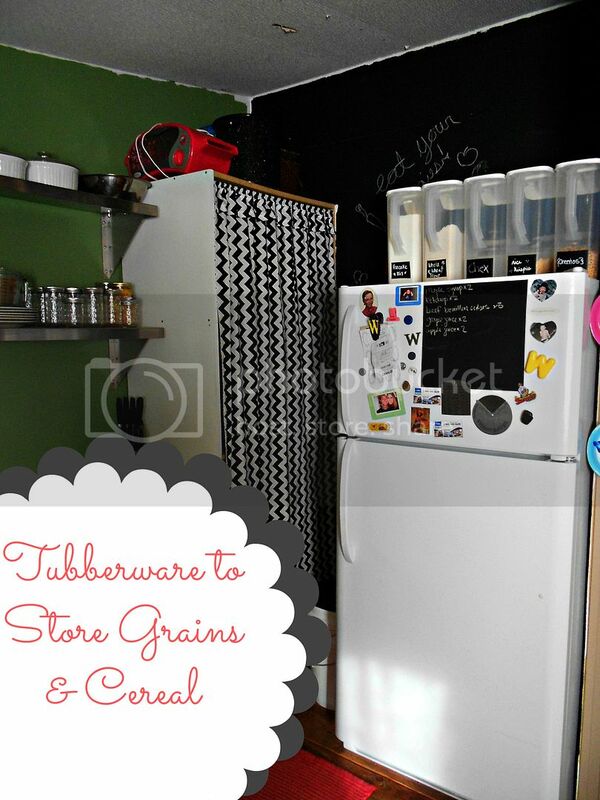 how did you make your cute chalkboard with the fun outline on your cupboard?